Accessories for blasting of paint booths: Filters and air filter elements and extraction. The sandblasting cabin can now have the best performance with our magnificent air filter for paint booths. See range of sale prices and buy now in the contact section or by calling, We will give you all the information you need! Complete range of air filters and filtration systems, for extraction, or air in cabins, walls and painting areas. Filter cartridges for particles of powder blasting and blasting, wet and dry pigments retention systems. Filters of active carbon etc..
ScandMist, separators of drops of oil were developed by Vokes Air, to eliminate oil mist and smoke atmosphere of the workshop. Removal of oil mist particles, smoke and harmful bacteria, generated by machines. Direct extraction from the source of emission, three-stage filtration. Clean air is returned directly to the clean workshop and overcoming the compliance of international standards of health and safety for maximum levels of exposure to cutting fluids (including OSHA, NIOSH and HSE etc). However, ScandMist is that removing oil mist for the improvement of the health and safety. With a wide range of oil separators, ScandMist, You can improve the productivity, lower costs and reduce energy consumption, all through a low-maintenance and easy to install design. In addition to the standard range of oil separators , We can also provide fully designed units and complete systems for measuring oil mist removal to meet your exact needs. 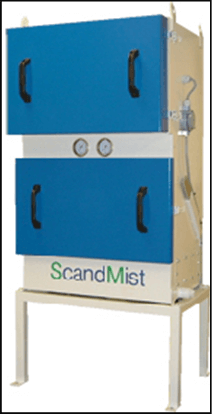 So if your current system for oil mist is failing or not have any system at all, expect ScandMist, to provide a cost effective solution to your problem of oil mist .